An easy and inexpensive thing to make is a fire pit for your backyard. It really comes in handy for company with children. The kids can grill their own hotdogs! They love it! Decide on location where your fire pit will be located. Make sure the area is free of debris and the surface is flat. Determine the size of the fire pit you wish to install. Each cinder block is approximately one foot long so this will make for easy measurements! Purchase cinder blocks. 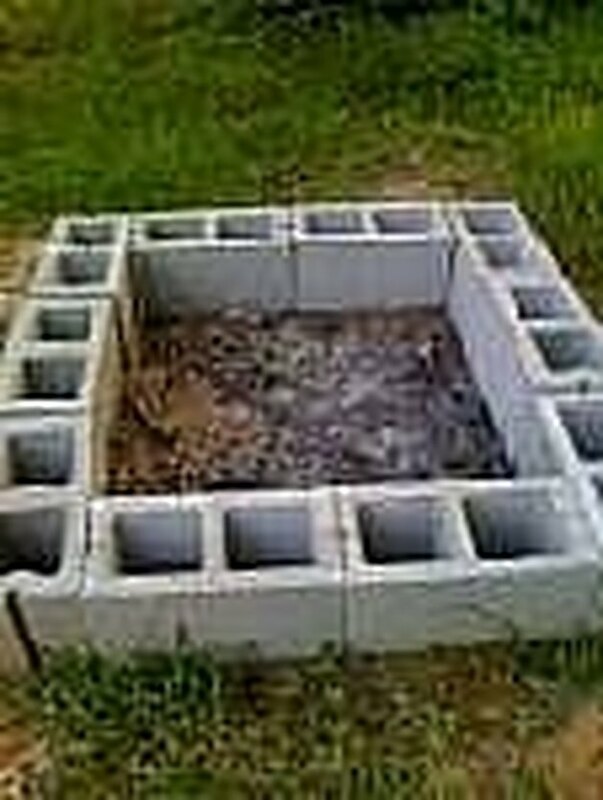 Arrange your cinder blocks in to a square like shown in the main picture above. Now you are ready for your kindling and charcoal. Next you will place your grill on top of the area prepared for fire if cooking meat. We use a portable folding grill that was under $20. It is coated and does not let meat stick. Otherwise, if having a wiener roast and using skewers or cloches hangers, omit the grill. You are now ready to light the fire and let the coals get hot. After 5-10 minutes of burning, your fire should be just right for grilling. Have fun and be sure to watch children around the fire!